USB GPS Dongle, Plug and Play. Works with most GPS software programs that conform to the NMEA-0183 Standard. Most mapping software packages will work with the EZ-GPS-G. The output is set at 4800 baud, NMEA. 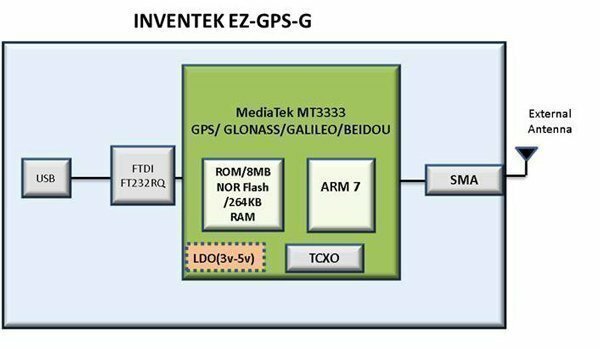 The EZ-GPS is based on the Media Tek radio in the Inventek GPS module part number ISM3333-C6.1. For detailed specification, please refer to the Inventek GPS module, part number ISM3334-C6.1 specification for the GPS details. The GPS has a female SMA connector for a direct antenna attachment. We suggest the use Inventek active waterproof dome antenna part number, ANTDOM-01-WPM that connects directly to the EZ-GPS-G. The product consists of a FTDI 232 USB device connected directly to the ISM3333-C6.1 GPS module. Download the FTDI software drivers for the computer operating system you are using (Links below) to connect to the USB . The GPS functional specification to understand how the GPS will operate.Once the FTDI USB drivers are loaded on your PC, just plug the USB dongle into the PC and the GPS will immediately be powered on and start streaming data to your GPS mapping program at 4800 baud. (Volume Pricing & Delivery)*Custom firmware builds are available with the ISM300F2-C5 family.